Do you have photos of the Bolero? If so, click here to upload them. Mein Schiff 4 is missing! MSC Meraviglia ship is missing! 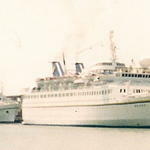 Cruise-ships.com is all about cruise ships and the people who love them. It's the best place to find information about a specific cruise ship, your favorite cruise line's fleet, or even what happened to your favorite cruise ship from the past.